I feel that before I get into the review for G X Todd’s new book we should have a quick check as to where the story is. This is necessary as in her new book Hunted (2018. 488 pages) this is something the author fails to do. Truth be told, I did read the first novel in the ‘Voices’ trilogy, Defender and even I felt more than a little lost. The world of ‘Voices’ is post-apocalyptic. It’s not the usual case of a war or a plague outbreak, like The Stand. The majority of the people in the world start to hear voices. The original novel doesn’t really address where they came from and neither does the new one. In a way it’s immaterial as it’s the impact of this event which sets up this new world. The book posits that the voices are real and can have a profound impact on those unfortunate to possess one. So, the world turns on itself. Some commit murder, others kill themselves, but the overall impact is a massive decrease in the world population virtually overnight, leaving a planet of crumbling buildings and traumatised survivors. Not all of those who hear voices are killed or attempt to kill others, leaving both the voiced and voiceless wary and antagonistic towards each other. The first book told of the journey of Red, Pilgrim and Lacey, the new one continues where Defender left off, but takes the opportunity to expand the world and characters as well as revisiting some old friends. The book is structured into three story strands. The first is Albus’ story. Albus is a strange man who has been gathering survivors into a secluded sea-side hotel. He seems to have visions which direct him to new recruits as well as the ability to see colours which emanate from those around him. He has a voice, but not in the same way as the others as he hears Ruby, his sister and a main character from the first book. The voice of his sister tells him to rescue the ‘martyr’ although he isn’t quite sure who this is as his one singular vision showed him two girls and a woman travelling together. In the second strand we follow Sunny and Beck as they are drawn into Posy’s unsavoury group. This group are on the hunt for Ruby, following the events of the Defender. Posy is host to a malevolent voice and is slowly losing his grip on his own body. The last group and the focus for all the searching is that of Lacey, Alex and Addison. They have a vague idea to head for the coasts were they may find sanctuary, all the time feeling that they are being followed. It’s not too obvious a point to say that the three strands eventually become one. Todd also uses flashbacks in the narrative and although they are well signposted, I admit I did occasionally get lost in all the back and forth. The book expands a little on the abilities of the voices, but they remain as much a mystery at the end of the second novel as they were at the end of the first. There’s a suggestion that they are nanotech, but I’m seriously hoping that that’s the case as a simple EMP would cure everyone. It might be better for the series if Todd took the bold step of never giving a full explanation, just leaving the mystery as it stands. The voices still have personalities distinct from the person they inhabit. Lacey’s voice is helpful, we think. It is hard to decide when you don’t actually know what they are and where they come from, and the novel intimates that the voices themselves might not even have this information. The world which all these people inhabit is suitably apocalyptic surrounded as they are by the rotting corpse of civilisation. That is not to say that Todd fails to bring her own take on this well-worn trope. The whole thing by the lake was very effectively disturbing and gruesome. Descriptions aside, like Stephen King, Todd is more interested how the world affects her characters and she certainly writes characters well. Each seems to have their own particularly distinct voice and the choices they make are often morally ambiguous. Nor is she shy about killing off significant players. 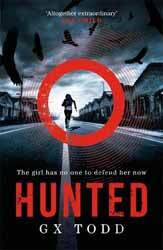 Apart for the lack of a bit of catch-up, this is a worthy successor to Defender, with two out of the three books coming in with a gripping narrative and empathetic characters; I look forward to the release of the last book.